With another gloomy rainy day, the kids and I headed into school for the purpose of grabbing a book that I wanted to bring home. But after a quick stop at Walmart (I found a cute little string of chalkboard flags and grabbed a black tablecloth) then Target (I found orange tape and a sign that I forgot to take a picture of), there was plenty for me to do in my room. And the kids had their kindles, so they were totally entertained. I worked on the walls a bit. I obviously need to get another black table cloth to finish it up. 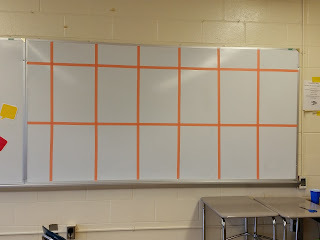 And then search for some cute orange borders for the bulletin board. And then put stuff on it, of course. 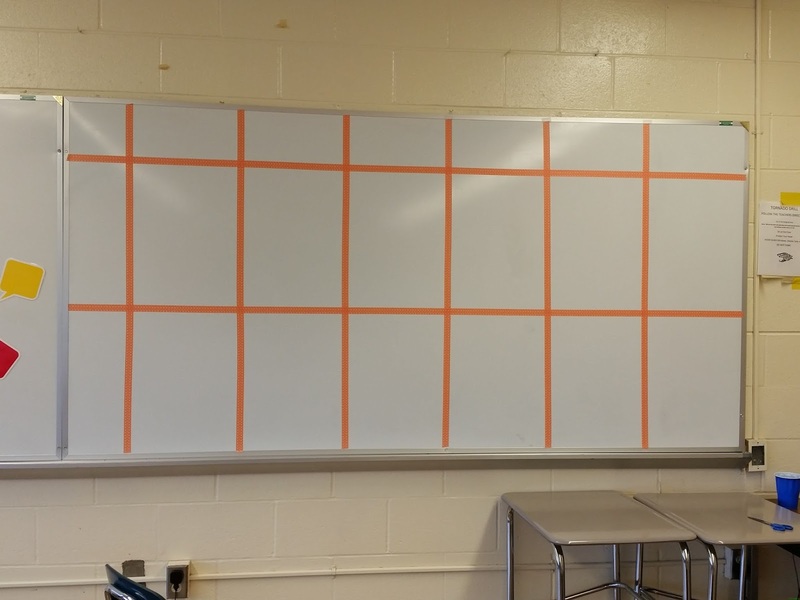 On the other side of the room, my boy and I measured and marked closely and ended up with this assignment board - love the orange tape! And then I found out that I'll actually have 3 different preps in the room, so I'll have to adjust the spacing. I'm going to put Monday through Friday across the top, plus a "next week" column. Each row will then represent a class. 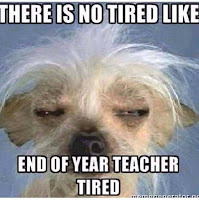 I checked in with one of our assistant principals and found out the actual classes I'll teach - CP Math 3, General Math 1, and Honors Precalculus. There was a possibility of teaching AP Stats (and I was freaking out a bit about it) but a coworker of mine has taught it before and wanted it back. Phew. I spent a few hours this afternoon working on Math 3, and I'm feeling pretty good about it. Much better than a few days ago, anyway! I've gotten courses started on Schoology (our LMS) and old stuff populated and organized a bit. I might actually be ready when school starts!